Kyphosis is a condition in which the curves of the spine are deformed. This condition is most commonly seen in children but can affect anyone at any age. Mild to moderate kyphosis can be treated non-surgically while severe cases need to be treated surgically. The most common surgical procedure used for kyphosis is spinal fusion, which involves fusing the vertebrae that make up the deformed curve. The spine can also be split into three curve segments. The c-shaped curves located at the neck (cervical spine) and lower back (lumbar spine) are called lordosis. The reverse c-shaped curve of the chest (thoracic spine) is called kyphosis. The thoracic spine should have a natural kyphosis between of 20 and 45 degrees. This curvature allows us to stand upright and to balance. Kyphosis occurs when the curve of the thoracic spine is greater than the normal range (more than 45 degrees). It affects children predominately but can affect all ages. The severity of kyphosis varies greatly and is generally dependent on how large the curve is. Additionally, there are several different types of kyphosis. The three most common are Postural kyphosis, Scheuermann’s kyphosis, and Congenital kyphosis. Postural kyphosis is the most usual type of kyphosis and is seen predominately in adolescence. It is characterized as poor posture or slouching and is not associated with severe structural spine abnormalities. Postural kyphosis can be corrected by standing up straight and is typically not painful but can lead to future problems if not addressed. Scheuermann’s kyphosis is caused by a structural abnormality in the spine. It often becomes apparent in adolescence. It usually develops in the thoracic spine but will occasionally affect the lower spine (lumbar). Rather than having a naturally curved spine, several consecutive vertebrae stick out at a larger angle than normal, resulting in the vertebrae wedging together toward the front of the spine. 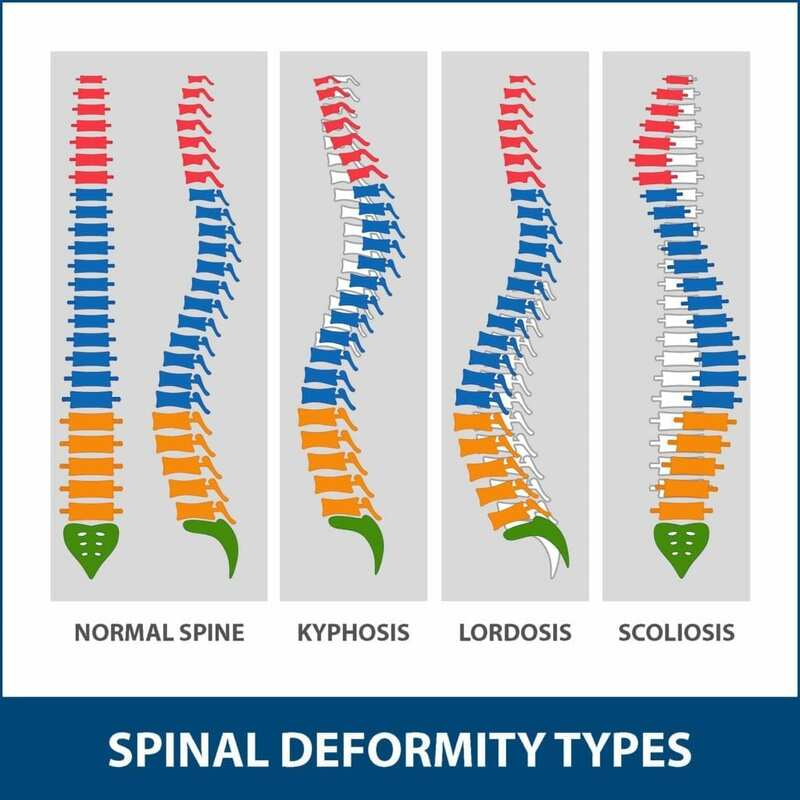 This deformity decreases the normal disc shape, while creating an exaggerated forward curvature in the upper back. Congenital kyphosis occurs when the spinal column fails to develop normally while the baby is in utero and is present at birth. Since this form of kyphosis worsens with age, patients will often need surgical treatment as quickly as possible to stop the progression of the curve so the spine can continue to grow normally. X-rays. This test provides images of dense structures such as bone and shows the spine and helps measure the degree of the kyphotic curve. Pulmonary function tests. Depending on the severity of the curve, this test may be ordered to determine if the spinal deformity is restricting breathing due to diminished chest space. MRI scan. This test creates an image of internal organs and structures and is used for severe cases of kyphosis that can potentially lead to spinal cord compression. 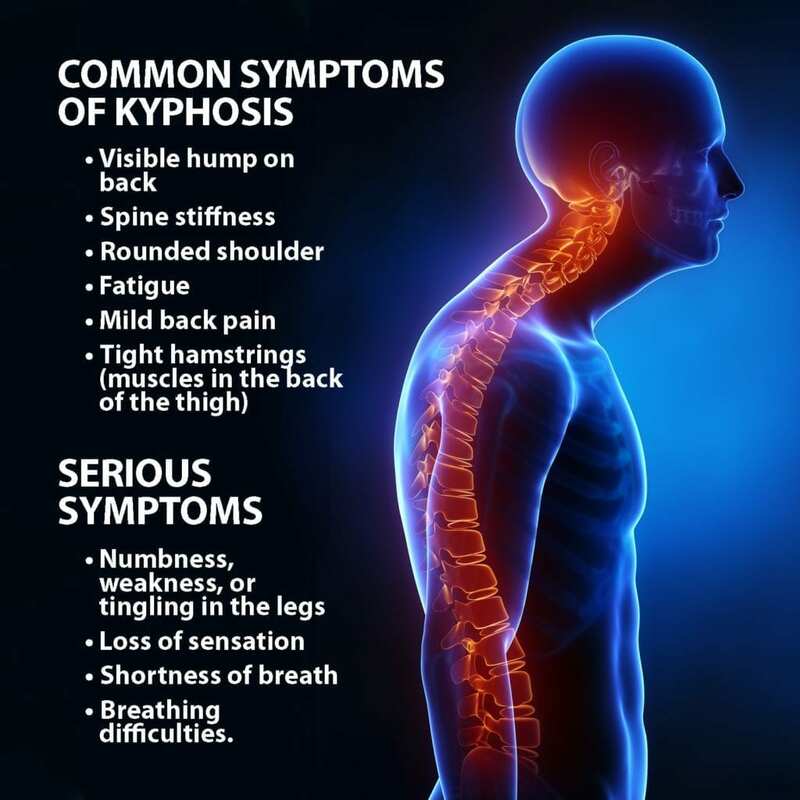 Both nonsurgical and surgical treatments are available for kyphosis. In mild to moderate cases, nonsurgical treatments can improve symptoms. Surgery is typically only used if the curve is larger than normal or if nonsurgical treatments have been exhausted with no improvements. Observation. Your physician will have you return for periodic visits to check the curve, ensuring it does not get worse. No other treatment may be necessary if the curve does not get worse. Physical therapy. Several exercises can help to improve posture and relieve back pain by strengthening muscles in the abdomen and back as well as other areas that are affected by misalignment of the spine. Medications. Non-steroidal anti-inflammatory drugs such as Advil and Motrin (ibuprofen) and Aleve (naproxen) can help relieve back pain. Braces. Braces may be recommended for younger patients with Scheuermann’s kyphosis who are still growing. The severity of the curve will determine the type of brace and amount of time it needs to be worn. Typically, the brace is worn until the child reaches skeletal maturity (when growing is complete). Surgery is only recommended to patients with Scheuermann’s kyphosis with a curve greater than 75 degrees or patients with severe back pain that does not improve with nonsurgical treatments. The most common procedure used for this condition is spinal fusion. This procedure reduces the degree of the curve and pain while preventing any further progression. During the procedure, the vertebrae in the curve are realigned, and metal screws, plates or rods are inserted to stabilize the spine further. Bone grafts (small pieces of bone) are then placed into the spaces between the vertebrae, and the spine is fused together. 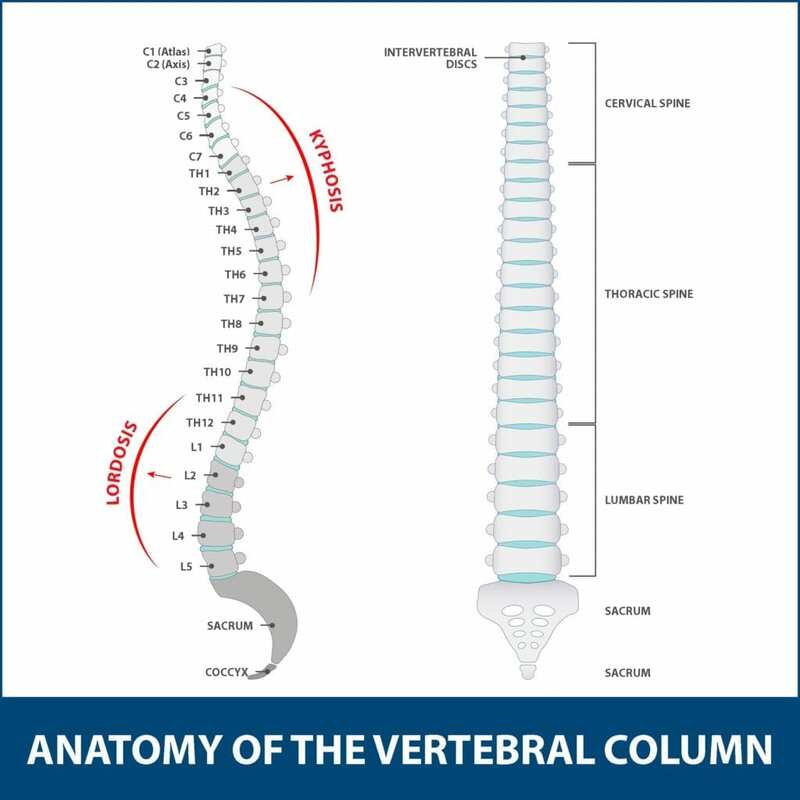 The amount of spine that is fused together is dependent on the severity of the curve since only the vertebrae that are a part of the curve are combined together. If kyphosis is diagnosed early enough, surgical treatments will not be necessary. If surgical treatments were required, recovery from spinal fusion lasts roughly three to six months and needs various types of physical therapy. If you or a family member suspect excessive back curvature, contact your Florida Orthopaedic Institute physician for more information on kyphosis.